Looking for a vacation spot close to home? Try these five family-friendly destinations. You don’t need to go far to find adventure. The Midwest offers a variety of activities for families with children of all ages. What it’s known for: With more than 200 water slides, Wisconsin Dells deserves its name — the waterpark capital of the world. Surrounded by steep cliffs with the Wisconsin River weaving between, the area has plenty of places to hike, fish and boat. Family hotspots: As the birthplace of indoor waterparks, you’ll have your pick here. Noah’s Ark, with its 70 acres of waterslides and watercoasters, is the largest. To explore the river, a number of boat tours are available. One popular choice is a land-to-sea amphibious ­vehicle — several operators offer this type of tour. What it’s known for: Lapping up the shores in the northwest stretch of Lake Michigan, Sleeping Bear Dunes ­National Lakeshore has miles of dunes and sandy beaches to explore. Hiking, driving tours and beaches are all part of the fun. Park entrance is $10 per car. Family hotspots: Located within the national lakeshore, the Dune Climb is a must-do stop. The 130-foot dune is deceptively hard to summit but offers gorgeous views at the top. The 7.4-mile Pierce Stocking Scenic Drive is worth the trip and includes several places to stop to see the views and snap a picture or two. What it’s known for: If you have car buffs or racing fans in your family, ­Indianapolis is the place to be. Here you’ll find the largest collection of racecars under one roof at the Indianapolis Motor Speedway Hall of Fame. Beyond cars, the city is dotted with museums and parks. Family hotspots: The Indianapolis Children’s Museum is one of the country’s largest and best of its kind. Its five levels cover science, art, history and culture — all disguised as fun exhibits you could spend a whole weekend exploring in this one museum. The White River State Park links several of the city’s best museums with walkways — and waterways. You can take a gondola (like those in Venice) to get around. What it’s known for: If you’ve ever wanted to try white water rafting, head for the highlands. Surrounded by state parks and rivers, this area is a draw for outdoor enthusiasts. Family hotspots: You can choose from calm waters to ­rumbling rapids, depending on the age of your kids (children ages 4 and older can go rafting). 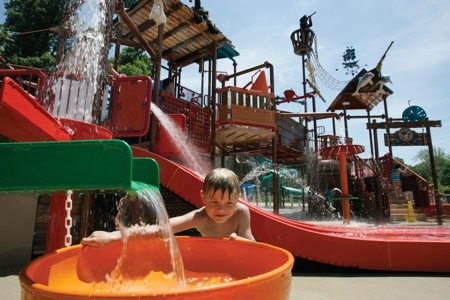 For gentler waters, head to Idlewild and SoakZone, a popular family amusement park. White water rafting at Youghiogheny River Ohiopyle State Park. What it’s known for: Also called the Ohio Appalachia, visiting Hocking Hills is like stepping into a fairy tale. There are caves to explore and trails that lead to towering waterfalls and much more natural wonders tucked throughout the parks that circle the area. Family hotspots: The most visited site in Hocking Hills is Old Man’s Cave — a towering recessed cave that digs into a cliffside. Beyond exploring on the ground, fly through the trees as part of the Hocking Hills Canopy Tours. The complex includes a variety of zipline courses, from a basic beginner route to a canopy tour to the SuperZip, which plunges you as fast as 50 miles per hour — on your stomach. Note: All drive times approximate from Cleveland — stops for traffic, meals, bathroom breaks and running around to get everyone’s wiggles out, not included. Photos courtesy of Visit Indy, Benzie County Visitors Bureau and Laurel Highlands Visitors Bureau.